El Shar-Pei es un perro de tipo primitivo y talla mediana. Es un excelente compañero, dotado de una gran sensibilidad y con un carácter tranquilo y equilibrado. Es el perro ideal para vivir en familia y compartir juegos con los más pequeños. Con el objetivo de realizar una adecuada selección de belleza, carácter y salud, todos nuestros ejemplares reproductores son estudiados genéticamente y sometidos a pruebas radiológicas oficiales (AVEPA), certificando que son aptos para la cría y que están libres de displasia y enfermedades genéticas. Nuestra intensa trayectoria por Exposiciones en todo el mundo nos ha proporcionado grandes logros, y nos enorgullece ser el único afijo en España que ha obtenido varios BIS en Monográficas, el primero en exponer sus Shar-Peis en la Exposición inglesa de Crufts y continuar siendo el Afijo que cuenta con más títulos de Campeones entre sus ejemplares. 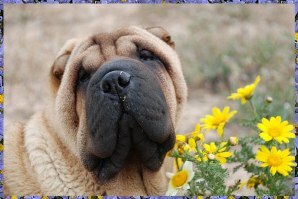 The Shar-Pei is a dog of primitive type and medium height. He is an excellent partner provided with a big sensibility and with a calm and balanced character. It's the dog ideal to live in family and to share games with the smallest. With the target to realize a suitable selection of beauty, character and health, all our reproductive dogs are studied genetically and submitted to radiological official tests (AVEPA), certifying that they are suitable to breed and that they are free of HD and genetic illnesses. Our intense trajectory for Dogs Shows around the world has provided to us good qualifications, and we are filled with pride to be the only Kennel in Spain that it has obtained seeveral BIS in Specialitys , the first one in show his Shar-Peis in the English Dog Show of Crufts and in keeping on being the Top Kennel that is provided with more Championship between his dogs.